Now taking deposits on CHOCOLATE & YELLOW puppies! NOW taking deposits on future CHESAPEAKE pups! Retrievers, we are a family owned Training, Breeding and Boarding Facility. 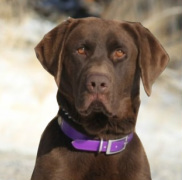 We have been training and raising Labrador Retrievers and Chesapeake Bay Retrievers full time for over 30 years. Please feel at home, take your time and look around if you have questions please don’t hesitate to call. Dustin Retriever puppies come from the very best Field Champion and Hunt Test dogs available, to produce a puppy that is intelligent, easy to train, eager to please and a joy to own. You will not just be owning a new dog but a new member of your family for many years. We will do our very best to help you choose the right litter to match your expectations. The decision to get your dog trained is a big one and at Dustin Retrievers we understand that. Just like every dog is different each owner is also. We will take the time to find out what you want out of your dog and what your dog is capable of. Dustin Retrievers offers an extensive training program. We have excellent training grounds for all types of waterfowl and upland hunting training. Whether it’s Puppy Introduction Training, Family Obedience, Gun Dog Training, Advanced Training with hand signals and whistle response, Competition Training with complex marks and blinds, or a simple Hunting Tune Up. Dustin Retrievers has the experience and knowledge to help your dog reach his full potential. Training Evaluations are FREE. After your dog goes home from training there is never a charge for one on one visits for follow up questions. We at Dustin Retrievers will do everything we can to help you feel confident about the knowledge you need to work with your dog in the field. Want the very BEST supplement for your dog?